ABS could have its next Request for Proposal (RFP) later this year for a new satellite. This is according to Jim Simpson, who recently replaced Tom Choi, a former Satellite Executive of the Year, as the company’s CEO. It is an intriguing new role for Simpson, who has worked on the satellite manufacturing side previously under Boeing, and now finds himself on “the other side of the fence.” Here, Simpson talks about new satellites, following Tom Choi’s footsteps, and the overall health of the ABS business. VIA SATELLITE: Having worked at Boeing and on the satellite manufacturing side, how do you assess the role of working as the CEO of a major regional satellite operator? What excites about you this role? Simpson: I loved Boeing and Aerojet Rocketdyne. I enjoyed working with all the technologies associated with satellite systems and working with the owner/operator to make sure, from a satellite perspective, they would be as successful as possible in achieving their sales goals, as well as their targets for customers relative to the frequencies they had available to them. The challenge was to see how we could improve their business as much as possible. I worked with them closely and it gave me an insight of what the owner/operator really needed from us to be able to make them successful. That is just one component of multiple elements of the satellite owner/operator. Now, I am on the operator’s perspective and am focusing on the end users and how to provide the best products and services. This is exciting; it is a new approach to being on the industry service side and providing the customer that capability. VIA SATELLITE: Your predecessor, Tom Choi, was with ABS since the start and is one of the most charismatic executives within our industry. How difficult do you think it will be to follow someone like him? Simpson: Tom is in the Hall of Fame. He is a friend and someone I have looked up to and respected. It is an honor to be the person to take over ABS from him. There are certain credentials from my background that I think can help move us forward. My goal is to further build our position and expand on the business as the most agile operator with a greater focus outside ABS’ traditional core markets. We will build upon the legacy that Tom has put together and make sure ABS continues to grow and prosper going forward. VIA SATELLITE: I think it is fair to say that ABS has been looking for a buyer for some considerable time, but no deal has materialized. Is this concerning to you? How would you assess the overall health of the ABS business? Simpson: ABS’ health is pretty good. We have six satellites; we have, from a capacity perspective, a stable set of revenues, and the opportunity to grow as we have additional capacity. We have available slots that we can mature. There are areas within the Direct-to-Home (DTH) business in which we can expand further and grow so we have a stable core. From that perspective, I think ABS’ position is solid, and we have the ability to grow upon the core. You asked why ABS has not been sold. I think what you see depends on valuations. Not many company sales have occurred in the last two years. It is less to do with ABS, and more with the entire environment and economics right now. As far as ABS is concerned, we are a stable and viable business. VIA SATELLITE: Where do you see the growth opportunities for ABS over the next two to three years? Simpson: I see the growth opportunities pushing into the DTH business in Asia. We have a number of orbital slots filed with the International Telecommunications Union (ITU). We are looking at how to creatively use those slots and work with potential partners. So, how do we grow through additional expansion? That is a key question for us. One sector of growth we would like to expand on is our U.S. government business and we are looking at different strategies. I don’t think the percentages of what we derive from video and data will change significantly from what they are now. VIA SATELLITE: ABS has also been known for very aggressive bandwidth pricing strategies. Is this something that will continue under your watch? Simpson: I think you are going to see our pricing strategy more regimented. It will be more of a function of the amount of bandwidth sold. Although we will be one of the cost-effective price leaders, you will see a potential retrenching. We will be looking to make sure our pricing is focused on the type of capacity, what region it serves and what the competition is. VIA SATELLITE: Do you have any early ideas in terms of capital expenditure plans for new satellites? Will ABS be putting out any RFPs this year? Simpson: The earliest timeframe would be at the end of the year with the likelihood for one RFP. We are reviewing parameters such as size, power, type of payload, electric propulsion — all these factors and others are being evaluated. VIA SATELLITE: With so many new constellations coming into the satellite industry, will it be tough for operators like ABS to find a niche in this complex communications ecosystem? Simpson: Clearly, we are looking at the new constellations and what their impacts might be in business areas. There will always be requirements for capacity in specific areas. Therefore, in those regions, we think we are very competitive, and in other regions, we can be competitive with new constellations. The jury is still out on whether these new constellations [will] emerge or not. O3b is already in existence and we are already working alongside them in these regions. We are a very good complement to some of those capabilities. I would say that, clearly, the constellations will increase the amount of capacity available, which then indicates there could be more competition. This could lead to pricing pressure. We think that we are pretty suited in competing in these regions against these new constellations. VIA SATELLITE: Do you think there will be more change in the satellite industry over the next 10 years than we have seen in the last 20 years? Simpson: I am going to say yes. We are seeing a lot of changes in electronic equipment and capabilities. We are starting to see smaller satellites with almost the same capacity we saw on big satellites a long time ago, driven by the requirements of new constellations, and the continual evolution of satellite and terminal technologies. In the next 10 years, as we get cheaper satellites, and lower cost and more available launch capacity, we will start to see the emergence of elasticity in the marketplace. Technology never drove cost points that enabled that to happen. We may start to see, for the first time, satellites and the space segment competing with fiber. If that happens, it will open up different markets from what the satellite industry has been in before. Whether that will happen or not, I don’t know. But the changes in technology, launch vehicles and manufacturing techniques could drive a substantial change in how satellites look, and what markets they play in. In addition to traditional RF communications, we are also seeing the incipient phase of laser communications, which has a possibility of further changing space communication. There are a lot of dynamics that could happen over the next 10 years. VIA SATELLITE: Finally, what would represent a successful year for you and ABS in 2018? 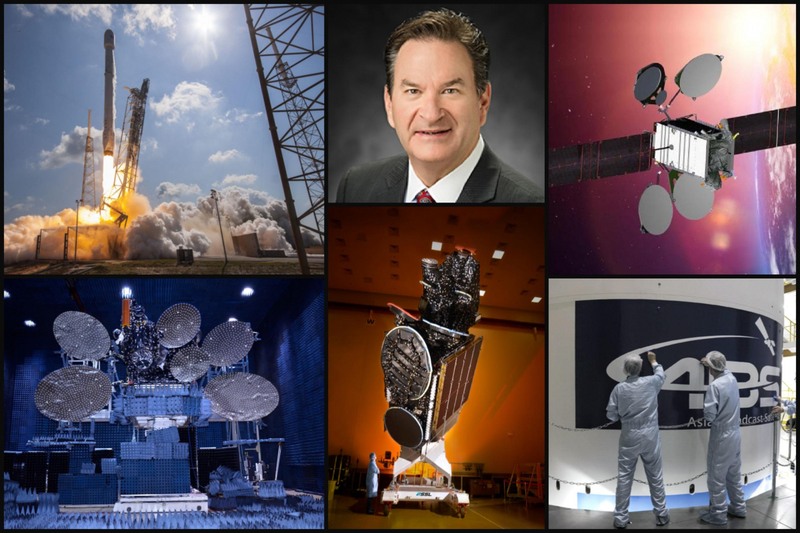 Simpson: A success 2018 for me would be continued growth in our Fixed Satellite Services (FSS) business. Secondly, we will look to populate some of our slots with satellites. We would like to start partnering with others and maturing these slots. Lastly, we would like to start seeing our DTH approaches maturing. If we see all these three approaches happening, as well as improving the efficiency of our operations, I would say ABS would be highly successful in 2018.